But when Paul had gathered a bundle of sticks and laid them on fire, a viper came out because of the heat and fastened on his hand. So when the natives saw the creature hanging from his hand they said that Paul was a murderer and that justice was not going to let him live. But he shook off the snake into the fire and suffered no harm. God has been with us just the way he was with Paul. This area is mostly covered with bushes and wild animals and especially snakes seek hiding places in our cracked walls and floor. More so they pursue frogs which hide behind water pots called Dapi in Luo. There have been many incidences where I just woke up and found a snake under my bed or entering through the roof. The sad thing about it is that our kids sleep on the floor. And without God’s protection we fear for the lives. To make it worse, there are no anti-venom drugs at the nearest health centres, and sometimes even at the District hospital 15km away. 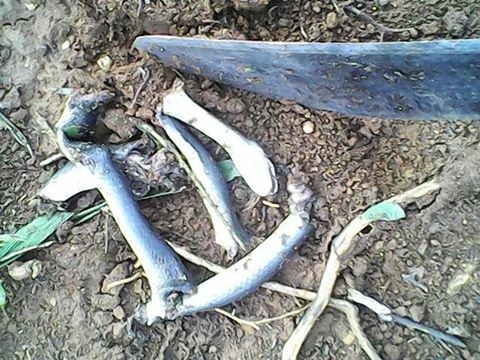 In the last 3 years 2 people died from snake bites while over 5 were treated by a local herbalist called Miyere. He is the one person the community relys on. This entry was posted in Sam's Blog and tagged Miyere, Paul, snakes on September 30, 2014 by eeAdmin.